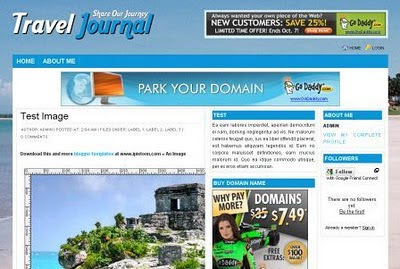 Travel Journal Blogger Template is cool. Great job. Thanks for the nice template. Nice template..asik yach templatenya.boleh didownload gak?? I appreciate your post, thanks for sharing the post, i want to hear more about this in future. Get free discount coupons from coupons2grab and save your money. Hi get best offers by doing shoping on cannyprices. clear and very beautiful blog..
it a really nice template. great job sir thanks for sharing wonderful template..
if this template is free this is a work of art. maybe i'll change my template with this one.